This was a difficult movie to get through. Had I been watching it at home, I may have never finished it at all. It’s long, uninteresting, and paced like one of those nightmares where you keep trying to run BUT YOU CAN’T! It’s that bad. Please be assured that I tried to like this movie. I tried hard. But in the end, it failed on every level a movie could fail on. 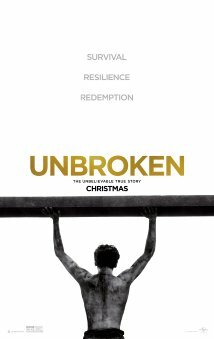 Unbroken is the truly harrowing story of Olympic athlete/prisoner of war, Louis Zamperini, whose name I had to look up just now because the movie does such a poor job characterizing him that he’s hardly a character at all. The only arc Louis has occurs within the first act of this very, very long movie. 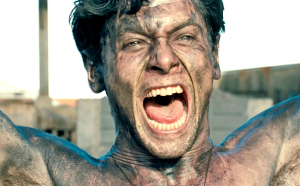 The story begins during his childhood, when Zamperini is a troublemaker – fighting, sneaking booze, stealing- much to the dismay of his Italian immigrant family who are struggling to be accepted in early 20th century America. Luckily for Louis, he takes up running and it makes him a better person, and now he’s perfect, and that’s the end of his development as a character … and there are still two hours to go. This first act is intercut with some promising scenes of WWII air combat. These hint at being exciting, but as it cuts between practical cockpit sets and digital dogfight action, the whole thing feels fake. Add to that the soft Tin Tin-esque quality of the visuals and suddenly every character looks either like a mannequin or a Norman Rockwell painting of Kyle Chandler. Suffice to say I was stunned to find that Roger Deakins did the cinematography. Guess they can’t all be winners. Anywho, Louis grows up by way of a running montage where he ages as he sprints along what appears to be the exact same country road set-piece from Forrest Gump. Blurgh. From here Unbroken becomes the POW story it’s been advertised to be. Our “hero” spends a bunch of time lost at sea and then in a Japanese POW camp. He is shot at, beaten up, attacked by sharks, tortured, etc. It’s as unbelievable a story as you can imagine, but since Zamperini is perfectly unshakeable, it carries no weight by way of being inspiring. It’s just empty brutality. As an audience we just wait it out while life tortures this poor man, simply knowing that he’ll never give up. And he never does. He never even comes close. So in effect, it’s just a ton of plot without an ounce of story. I reiterate: this movie features plane crashes, shark attacks, explosions, fights, torture, Olympic sports — how can this be so boring?!? The script is terrible. Almost every character speaks entirely in clichés (seriously what does “if you can take it, you can make it” even mean, besides nothing?). There are attempts at humor that are searingly uncomfortable, and enough faux-prestige schmaltz to sink the SS Merchant Ivory. Knowing that the Coen brothers did a draft of this script, I was hoping that something would occur which distinctly bears their mark, but there is nothing. The score, which should never be expressly noticeable ends up being either oppressive or non-existent. Torture sequences (roughly 80% of the movie) are populated only with gruesome sound effects while “heroic moments” (times where the lead character screams triumphantly while standing tall — the remaining 20%), are scored with ambient choruses, like the stuff you hear in a nature documentary when the babies are born. As a director, Angelina Jolie clearly knows how to point a camera at stuff, and there are moments where the film school project she never made begins to shine through, but there is nothing of note to report. I can’t help feeling like Jolie really wanted to make a masterpiece, unaware that not only is she as of yet incapable of such a feat, but that the studio only hired her as a box office draw. It’s hard to comment on the acting because there is not one character who is memorable. Everybody is an extra, but one guy a little less so than everyone else, and I probably won’t remember his name tomorrow.